How cute are these?!?! I can't believe how simple yet beautiful these mini Christmas Trees are. I can't believe I MADE THESE! I saw a few pictures of similar designed popsicle stick Christmas Trees via Pinterest so I decided I would give it a try myself. Step 1 - cut the edges of the popsicle sticks so that you have flat ends. You want two the same size (just trim the edges) and then 6 other sticks cut gradually smaller and smaller. Step 2 - paint the sticks. I painted both sides - you just need to leave time for it to dry. 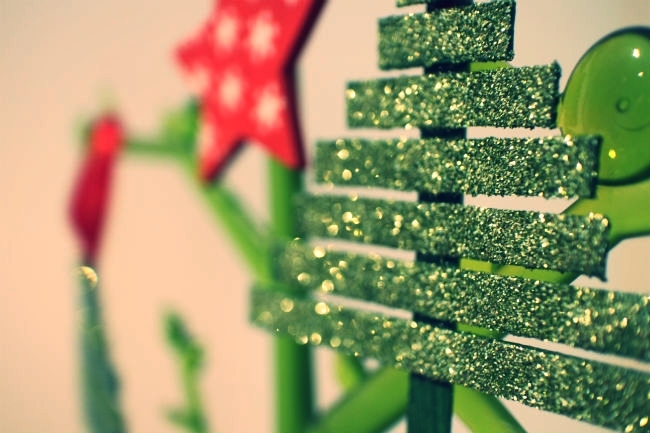 If you are using glitter on your trees then you will need to sprinkle the glitter on the wet paint and press down lightly to get it to stick. Step 4 - glue the smallest piece over the ribbon then continue down the tree backing until you get to the biggest piece. Allow the glue to dry. 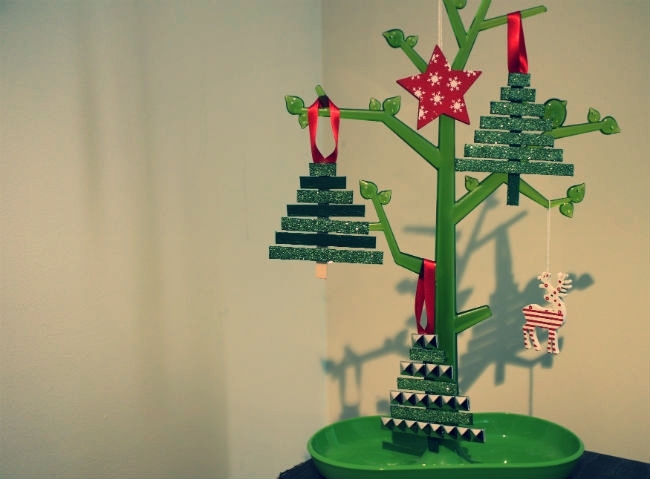 Once the glue has dried you can decorate your trees as much or as little as you like. I really like the look of the glitter only on the trees. 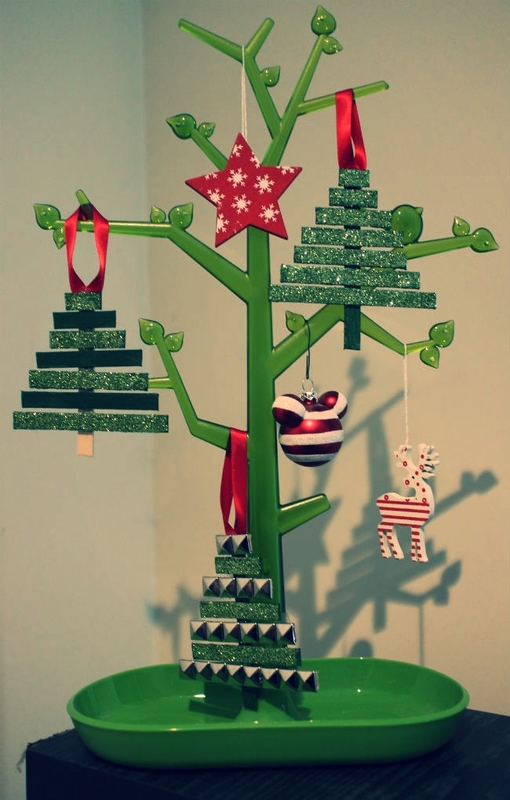 I also used some leftover studs to create the bottom tree. 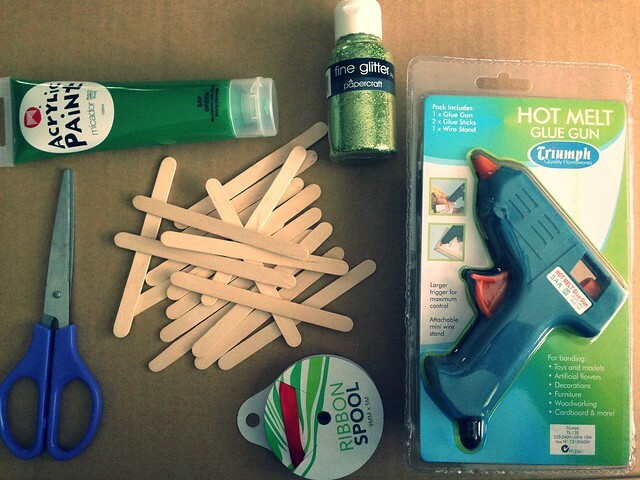 I used the hot glue gun to attach the studs to the popsicle stick. The best thing about these Christmas Trees is that you can customise them to match whatever you want. If you want to paint them purple, DO IT, if you want to cover them in pom poms, DO IT, if you want each level to be a different colour, GO FOR IT! I really love the idea of home made Christmas decorations. I'm going to try and do a couple more DIY Christmas decorations before the big day arrives. I'm not normally a super crafty person so I started with the easiest one to ease my way into it. Have you got anything you are going to try this year for Christmas? Have you made any decorations in your house? I was so confused for a moment, I thought you had made that tree that you're hanging the mini trees from. I couldn't tell how it was made out of possible sticks! But yes I love this, might make some with my kids. I am Brooke. I am a travel agent. I like to travel. I like music. I like bands. I like to write about my stories and this space right here is where I do that.